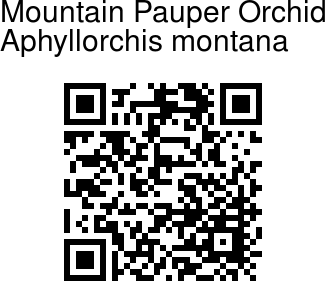 Mountain Pauper Orchid is a large to giant sized, hot to cool growing, terrestrial orchid with a basally thick and fleshy, erect stem enveloped by several short sheaths. The plant is leafless when blooming. Flowers are wide open, borne in a loosely many flowered, 30 cm tall, raceme with oblong-ligulate, floral bracts. Flowers are yellow, 3 x 1 cm; dorsal sepal 13 x 4 mm, oblong, blunt; lateral sepals 11 x 3 mm, oblong, blunt; petals 11 x 3 mm, oblong, blunt; lip 9 x 5 mm, ovate, pointed, 3-lobed, side lobes obliquely ovate-blunt; midlobe ovate, pointed. 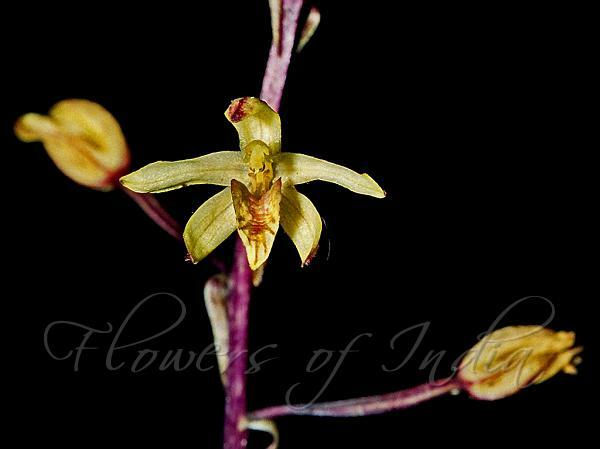 Mountain Pauper Orchid is found in Indo-Malesia, South India. It is laso found in the eastern Himalayas, NE India, Bhutan, at elevations of 500-1700 m.
Identification credit: P.S. Sivaprasad Photographed in Topslip, Anamalais, Tamil Nadu.